There are endless possibilities on the things that you can as you do bathroom redecorating and remodeling. Depending on your taste and budget, there are plenty of things that you can try as you come up with an overall design that would give you the beauty and functionality that you are looking for. Here are some tips that you could consider. First off, you might want to introduce color into your bathroom. 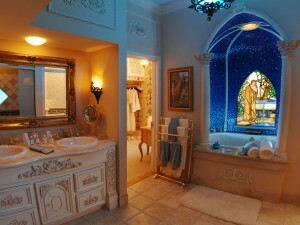 The introduction of colors can instantly enhance the look of your bathroom without having to do a lot or spend a lot. You might want to repaint your bathroom or put up a colorful shower curtain that would suit the individuals who would be using the bathroom. When choosing colors, make sure to check which color combination would work best for the style that you want to achieve. Also, if you have a small bathroom, you might want to go for bright or light colors that would give the illusion of a bigger space. If you are on a budget, you could also choose to just replace only one main fixture of your bathroom instead of all the fixtures. Since most of the time, the vanity and the sink are the focal points of a bathroom, you could choose to buy a new one that would accentuate a certain area of your bathroom. This could already give you a whole new look for your bathroom. You can even choose to look for vintage but still functional sinks from garage sales and online auction sites which could both be stylish and cost-effective. Lastly, you might want to add some storage space in your bathroom. This would particularly be a good idea if you have a small and cluttered bathroom. There are plenty of space-saving storage fixtures that are available in the market today which can free up a lot of floor space, making your bathroom a lot more spacious. These ideas could definitely help you in bathroom redecorating and remodeling without having to put in a lot of effort or money into the project. Try looking for other ideas and writing them down so you could come up with a plan and budget first before starting to work on your project.